Three conditions are required for fires to start and spread – an ignition source, fuel, and oxygen. Sources of ignition can include heating equipment, stoves, power-tools, machinery and cigarettes, while fuel sources might include paper, rags or cloths, flammable chemicals, gases and wood. Oxygen of course is required for fire and is provided inside a building through ventilation and air-conditioners. When all three come together and a fire occurs, the potential for damage and injury can be massive. To practice good fire safety you need to understand the different types of fire and have the right plan and equipment in place to deal with them if they occur. Of course it’s also vital to have good fire-prevention strategies in place to minimise the risk of fire occurring in the first place. Electrical – ensure that all electrical cords, outlets and switches are in good condition, and appliances are properly connected and earthed. Older buildings should be professionally inspected for the condition of their electrical wiring. For more tips see the article on electrical safety. Arson attack – remove fuel sources and combustible items that could be used in an arson attack. Install adequate exterior lighting and remove shrubs or other potential hiding spots for intruders. Cooking – if using kitchen or outside cooking facilities, make sure that stoves are continually monitored and attended to, and that appropriate clothing is worn by those doing the cooking (no long draping sleeves or scarves for instance). Kitchen equipment should also be kept in good condition and free of grease build-up. Candles – while candles often provide a special atmosphere, they can also increase the risk of fire if left unattended, on unstable surfaces or near flammable items. A better option might be to use candle-shaped light-globes that provide the look of candles without the increased level of fire-risk. See our article on candle safety for more information. Furnaces / heaters – flammable items should never be placed anywhere near heaters, and furnaces and chimneys should be inspected and cleaned at least once a year. Smoking – designate particular spots outside for smokers and provide an adequate number of ash-trays. Inspect all ash-trays regularly for smouldering cigarette-butts or ashes. Tools & equipment – particular care should be taken in the use of tools that produce heat or spark, especially if flammable items such as building debris or rags are in the vicinity. Building and grounds – considerations include the use of fire-doors, fire-retardant materials, adequate ventilation, removal of leaf-litter and debris from the roof and outside areas, and regular lawn-mowing and tree-pruning. Alarm / sprinkler devices – these include smoke detectors, fire-alarms, and heat- and/or flame-detectors. Sprinkler systems are designed detect heat and to activate only in the region of the fire itself, which may enable the fire to be contained and also provide time for occupants to evacuate. Fire-extinguishers, fire-blankets and hose-reels – the important thing about portable fire equipment is in knowing which device to use for a particular type of fire. It’s important to note that portable devices should only ever be used for small fires. More information on fire-equipment can be accessed here. Fire-drills – these should be practised on a regular basis so that members of the congregation know what to do if fire breaks out. Fire-exits should be adequately marked and kept free of obstruction. You can also find more information on developing emergency plans here. 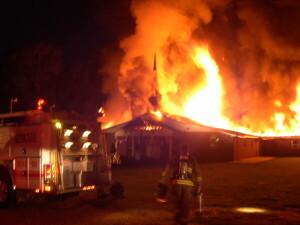 If a fire does occur in your church building, activate your evacuation plan and call the nearest fire station. Contain the fire if you can, but if not leave it to the professionals – the most important consideration is safety of all building occupants. If property damage occurs, contact your CCI office to discuss the option of an insurance claim.